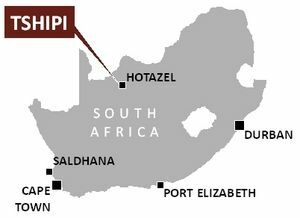 Jupiter is an Australian registered public company listed on the Australian Securities Exchange ("ASX") which has as its main asset a 49.9% beneficial interest in Tshipi é Ntle, an independently operated and managed, black empowered manganese mining company, currently operating the Tshipi Borwa Manganese Mine (Tshipi or Tshipi Mine). Jupiter also has two iron ore projects in the Yilgarn region of Western Australia. Tshipi Borwa - A world class manganese mine with an open pit mine designed to produce 2.4mtpa of manganese ore grading 37%. The mine has been producing and exporting manganese ore since December 2012. Tshipi Borwa is one of the largest and lowest cost manganese exporters globally. Mount Ida - Inferred resource (JORC) of 1.85 billion tonnes @ 29.48% Fe. Scoping study completed in March 2011. Feasibility study highly advanced, currently on hold due to adverse economic conditions. Mount Mason - Measured and Indicated resource (JORC) of 9.4mt @ 59.4% Fe. Feasibility study completed in May 2012. Currently on hold due to adverse economic conditions.